Based on your individual treatment, you may be required to wear rubber bands. Rubber bands helps to fit the upper teeth with the lower teeth. It is important to comply and follow instructions as the teeth and jaw cannot move into the correct location without the use of rubber bands. The more precisely you cooperate and follow Dr. Moore's instructions, the quicker things will move into place. If you become sore, you can take whatever you usually take for a headache. Take your retainer out of your mouth to eat or drink. Remember to put the retainer in its case when it is outside your mouth. Keep your retainer away from pets or it will end up being a very expensive chew toy. To clean the retainer, brush it thoroughly once a day with a toothbrush and toothpaste. Use cold or lukewarm water. You may also use denture cleaner or retainer cleaner tablets. If you lose or break your retainer, please call our office. Do not leave your retainer in a hot car. Do not put your retainer in the dishwasher. Do not wrap your retainer in a napkin. 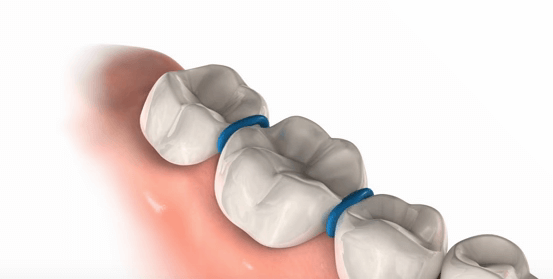 This is the #1 way patients lose their retainers. Always put the retainer in its case when it is outside your mouth. Retainers are breakable. Please treat them with care. A rapid palatal expander is a type of appliance that widens the upper jaw. In some cases, it is necessary to expand the upper jaw so that it will fit properly with the lower jaw. In other cases, it is used to create room for crowded teeth or used to correct a cross bite. Once the expander is activated to the proper width, the expander is held in place until new bone is formed. The palatal expander is activated by a key that is inserted into the mouth. After a turning, the patient may feel a little pressure/discomfort. This feeling should go away after several minutes. If discomfort persists, take whatever you take for pain such as Tylenol or Advil every 4-6 hours. Remember if the expander is poking or rubbing put wax on the area. If the expander becomes loose or the irritation persists, please call our office. Make sure you avoid hard, sticky, or crunchy foods including popcorn. To clean the expander, brush every part of the appliance 2-3 times a day. Replace your rubber bands often and remove them when eating. It is best to change the elastics every 4 hours. If our appliance becomes detached from your tooth, please call our office to have it reattached. Feeling some discomfort is common. You may take whatever you use to relieve a headache to make you more comfortable. Try to avoid hard or sticky foods that can get caught in or break the appliance. Please use the proper rubber bands given to you by Dr. Moore. The Forsus appliance is an appliance used to reduce overbite problems. It improves the fit of the teeth and is generally worn for 6-9 months. Getting comfortable with the appliance can take several days. As you are getting used to it, you may use wax or salt water rinses to ease any irritations. You bite may start to feel like your teeth do not fit together. This feeling is only temporary and will improve as the teeth adjust. Avoid hard or sticky foods that can get caught in or break the appliance. Brushing your teeth and the Forsus appliance after meals is recommended. The appliance is designed to move with your normal mouth movements during eating and speaking. However, it is recommended not to open your mouth extremely wide or the appliance will disengage. If the spring comes away from the rod, compress the spring until it fits back onto the rod. Please call the office with any questions or any issues that may arise. The Herbst appliance is an orthopedic appliance used to correct the jaw and any tooth imbalances when the patient has a severe overbite. It is usually worn for 12 months. This appliance can possibly prevent the need for jaw surgery. Expect the tongue, cheeks and lips to be a little sore for the first few days. You may develop sores on your cheeks if the “rods/tubes” are rubbing. You may place wax on these areas to help reduce any discomfort. Warm salt water rinses can also help the sores to heal. For the first few days try eating foods such as pasta and rice until you get used to the Herbst appliance. Stay away from hard, crunchy, and sticky foods. Remember that the Herbst is durable but it is not indestructible. Be careful when eating. Make sure you take good care of your Herbst. When you brush your teeth, you should also brush your Herbst appliance. If you have any issues, please call the office.